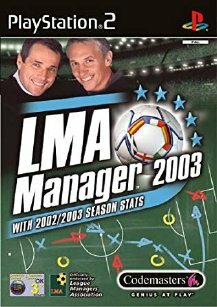 The best-selling football management game on console, packed with all players, strips, stadia, managers and stats of the 2002/03 season. Pick your favourite team and lead them to the League position you know they deserve. The dream of a career in football is yours, as you manage teams from any of the 16 divisions in England, Scotland, France, Germany, Italy and Spain. – Create your own tactics & playing style. – Full European player transfer market. – Interactive highlights & replays. – Play classic football team tactics. – 32 ultra-detailed players per squad. – Fast, easy-to-use controls & gameplay. Featuring exclusive commentary from Gary Lineker and Alan Hansen.